Sing it with me now, “Should old acquaintance be forgot and never brought to mind…” Aaaaah it’s that time again. A brand new year. I love new beginnings and a new year is a wonderful beginning filled with promise & possibility. Many folks celebrate the new year by making New Year Resolutions. You know the ones – “I resolve to lose weight, or save money, or (fill in the blank)“. I think reaching for improvement is an important thing to do and there’s no time like the start of a brand spankin’ new year to do that. But even though your heart’s in the right place those open-ended resolutions often get forgotten within the first two weeks of the new year. #amiright?? I quit doing New Year’s Resolutions several years ago and somehow the aspirations I have for improving things into the new year have not been abandoned. How do I do it? Read on. Well, I quit making New Year’s Resolutions and instead starting making New Year’s GOALS. Stay with me now, there’s a point to be made. Writing a long list of goals on a piece of paper will be forgotten in the same amount of time those resolutions did – you need a way to actually attain your goals. 1 – Don’t make your goals out of reach for you. Goals should be a challenge to attain but not insurmountable. 2 – Don’t list your goals in an obscure way. Saying “Get In Better Shape” won’t give you any real direction to be able to meet your goals. Instead you might make it a goal to “Walk briskly 30 minutes a day three times each week”. 3 – Now that you have your well-defined goals listed, make a list of steps to reach your goals. If you plan to plant a veggie garden this year don’t just write down a goal of “Plant A Garden”. First make plans to select your garden spot, then to amend the soil, then to plant your veggies. As you can see some months have more than one task to complete. I try to schedule tasks that will be appropriate for the time of year – no outside tasks during the scourge of my existence (ragweed season), outside tasks when the weather will be warmer, etc. Now that I have my tasks all laid out I go into my email’s calendar and note at each month what the task to complete will be. I set up a reminder to email me the first of the month with this month’s task(s) to be completed. Now when I receive my reminder I’ll set out to complete that month’s task(s) as quickly as possible. Then at the end of the year – bada-bing, bada-BOOM all the tasks I had dreamed of completing waaaaay back at the beginning of the year are completed. Do you do New Year’s Resolutions? Do you write down goals instead? If you’ve been frustrated about the lack of motivation & staying power in the past give this procedure a try, I think you’ll be pleasantly surprised at the results. 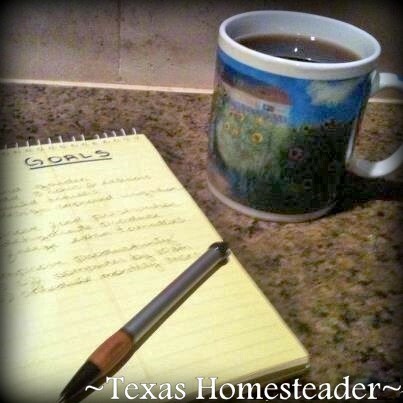 This entry was posted in Blog Posts and tagged Holidays, Inspirational, Winter on January 4, 2015 by Texas Homesteader. I do something very similar. Sometimes, my goal is as simple as “track calories daily.” I eat less, but the goal is just to track. I love the fresh start of a new year! I make goals and resolutions for myself. Sometimes they actually work out, and sometimes I get to the following December and wonder what I was thinking! I have always been terrible at keeping New Year’s Resolutions, so this year I did the same as you. Made a list of goals I wanted to achieve for the year, and made sure they were reasonable. Thank you for sharing your tips with us at Merry Monday! Love having you link up each week! I love making a plan for the year, nothing huge but putting things we want to accomplish on the calendar really helps to make sure they actually get done. Thanks for sharing with us at Simple Lives Thursday; hope to see you again this week. This is my first year of making Attainable Goals. Used to I made them too high for my Disabled Body. But now I know what I am capable of and what I am not so it is making it easier to do this year. I am taking care to get my Spiritual Growth in first, but I am finally getting started on my life long dream of writing a book. I have taken the Leap of Faith and contacted the Publisher even though the book is still in my head and not in the computer yet,lol. I found you through Thursday Favorite Things at Katherine’s Corner. I’ve quit with drastic resolutions as well. I make goals too, and try to make them with some deadline, like running for weight loss and signing up for a 5k race. I like the email reminders though, that’s a great idea! No resolutions here either, it never works. I agree, goals are better. My goals is to try more quilt patterns with new material, get my chicken coop build and get 2-3 chickens for my little backyard. Then I’ll think of rabbits. My biggest goal is finding someone to house and pet sit when I want to take a trip to visit family. Good luck with yours. I don’t make resolutions. I do make a goals list and put it out there on the blog for the world to see and for myself- I can refer back! I didn’t do that this year. 2014s goals were mostly accomplished– I have a few carry overs – and will focus more effort there. I also choose #OLW ( one little word) and I refer to it often! Last years word… Balance … Was a hit and a miss! I may refine my methods this year – after reading this. I had thought of chucking the whole idea; but if you aim at nothing you hit it every time! Great post!